While fiction in (English) translation can appear fairly invisible at times, there are books which are genuinely well known throughout the Anglosphere, not all of them coming from nineteenth-century Russia. One such novel is Albert Camus’ work L’Étranger (variously known as The Outsider or The Stranger), which has become as much a part of pop culture overseas as in France, so when a writer decides to take the book as the starting point for his own novel, you can be sure of one thing – there’s bound to be a lot of interest. The anti-hero of Camus’ novel is shown in a new light here as Harun explains to the visitor, and the reader, how Meursault’s account of affairs, published after his release from prison, has become so widely known. However, despite the Frenchman’s in-depth discussion of his life and crime, there’s something that seems to have been forgotten. Meursault’s victim has disappeared, whitewashed from the pages of the novel and from history, a nameless victim of the writer’s philosophical struggles. And that’s why now, in the dark, dingy Oran bar, Harun has decided it’s time to tell the other side of the story. By all accounts, The Meursault Investigation is an important book. It’s been sweeping up prizes in France, and it would be surprising to see it ignored in next year’s IFFP and BTBA prize season too. If you’re a fan of Camus’ work, this is required reading, a new take on an old story, one which examines our beliefs and shows us that every tale has at least two sides. By re-examining the evidence, we might find that our opinions (and our sympathies) change somewhat – history is never static. This is probably a good place to praise the excellent work done by Cullen, as the success of the voice is an important part of the novel. Harun is a mesmerising presence, and I could feel how the original would have sounded without the need to back-translate, the speaker’s vibrancy coming through in the new language. As the story progresses, we see that Harun’s anger has less to do with the murder itself than with the way in which his brother, Musa, has been erased from history, his only remaining trace an anonymous corpse on the beach, one which swiftly vanishes forever. One of the focuses of the ‘investigation’ is on examining Meursault’s ‘testimony’ and correcting it. Early on, Harun informs us that he has no sister, and that the woman who provoked the incident was probably a prostitute. It’s a minor detail, but it’s to prove the thin end of the wedge, with Harun (and Daoud) using the doubt this event inspires to examine other ‘facts’ of the story, even questioning Meursault’s presence at his mother’s funeral. We only have Meursault’s word as to what happened, and if one detail is wrong, how can we be sure that the rest is true? While Harun wants to introduce the reader to Musa, giving his brother a presence denied him by Meursault, he’s also acting on behalf of his community. L’Étranger is the voice of the French in Algeria, les pieds-noirs, but Daoud’s book gives the natives a voice, acting as a post-colonial rewriting, or correction, of history, using the oppressors’ language to strike back. Part of the fascination of the book for the casual reader are the parallels found between the two stories, starting from the very first line, in which we learn “Mama’s still alive today”. Anyone who has read Camus’ novel will see allusions all over the place, with Harun’s mother living in Marengo (where Meursault’s mother died) and Harun himself spending time in prison and arguing with an imam. Even the plot structure is similar, with its fateful twist half-way through. In fact, Harun is a counterpart of sorts to Meursault, his life echoing the past. He has his own demons to face, his own suspicion of organised religion, his arrest and jail time mirroring Meursault’s own (down to the question he’s asked in prison…). Like Meursault, he’s persecuted not for what he has done but what he hasn’t done; while Meursault is condemned for the lack of grief shown after his mother’s death, Harun’s absent enthusiasm for the cause of independence almost costs him his life. There’s also a mirroring of the voices, Harun’s warm, passionate plea for life contrasted with Meursault’s cold, nihilistic tone of the grave. The ties between the two books are unmistakable and inextricable, and the blurb from French magazine Le Monde des Livres (“In the future, The Stranger and The Meursault Investigation will be read side by side.”) sums up most people’s thoughts. It’s probably a fair assessment (it’s certainly what I did), and it’s impossible not to compare the two. But is that a good thing? There’s a fine line between homage and fan-fiction, and while The Meursault Investigation is a long way from Pride and Prejudice and Zombies, it can tread that line rather precariously. At times, there’s an uneasy conflict between pop references to a classic novel and Daoud’s attempt to create a lasting work of his own. Yes, it’s entertaining, but is it really The Meursault Investigation or merely L’Étranger redux? On occasion, I found myself simply looking for references to Camus’ work, feeling smug when I found them – but does that make it a successful piece of literature in its own right? Like the shadowy ‘ghost’ in Harun’s bar, Meursault is constantly in the background, a presence which threatens to overshadow Daoud’s work. I thought this was brilliant …I read it in French when it was first published . I didn’t see it as fan fiction at all ….certainly it’s an homage ..and I loved those echoes you refer to …but I thought it was a very clever way of re-telling the story of modern Algeria. The voice of Harun was compelling . 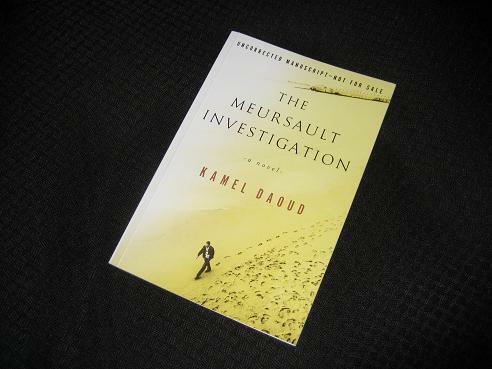 I thought Daoud pulled off an incredible feat ….a tribute to Camus as well as confronting history and the present day . I can’t believe it – due for publication on 2 July, I ordered my copy of this yesterday!!! My thoughts will be a few months coming one would think, given my “to be read” pile. Was attempting to get a little ahead of the IFFP longlist for 2016, thinking this would be high on judges lists. Thanks for the review. I commented a bit on a paragraph between the French and English versions in my billet.